Two stars of the 2011 draft class, J.J. Watt and Julio Jones, will square off on Sunday. Five years after they entered the league together as part of the 2011 NFL Draft class, Houston Texans defensive end J.J. Watt and Atlanta Falcons wide receiver Julio Jones will meet again when the two teams square off on Sunday. The pair worked out together in Arizona prior to the draft, with Jones going sixth overall to Atlanta and the Texans grabbing Watt five spots later. They faced off as rookies, with Jones catching four passes for 69 yards in a 17-10 Houston win and Watt recording three hits on Falcons quarterback Matt Ryan. In the years since, Watt and Jones have established themselves as two of the NFL’s top young stars. "(Watt’s) definitely a great player," Jones said, per ESPN’s Vaughn McClure. "He was the MVP as far as defense, defensive player of the year. I trained with J.J. I know his motor. He has a high, high motor. He’s definitely one of the best that does it right now in the business, along with (Jadeveon) Clowney as well." Watt expressed an equal amount of admiration for Jones, who leads all receivers with 34 receptions for 440 yards through the first three games. "He’s an extremely hard worker, but he’s earned his physical traits," Watt said. "The guy goes out there, he works hard. He’s a physical freak for a reason because he puts in the work. Some of the things that he does on the field, both from a speed aspect and a strength aspect, he’s a pretty incredible player to watch. "Our draft class that year was pretty incredible in its own right. I mean, you look at the guys that came out of that draft, even the guys that were just at the training facility we were at, it was pretty incredible. It’s fun to see guys have success from that class, but you also know why guys have success because they put in the work. Julio is a guy that has put in the work and he continues to. I think that’s why he’s so good." 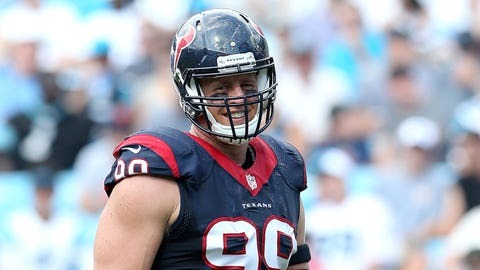 Watt and Texans will try to hand the undefeated Falcons their first loss of the season Sunday in the Georgia Dome.